That's a joke..it is coming in like a Lion...snowing and blowing.. But still it is March, and time to start the celebration of the wearin' of the green! This is a chocolate cake, done in a molten lava pan.. 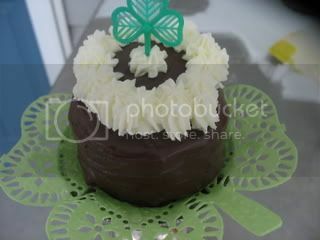 It is iced with chocolate, and trimmed with whipped cream.. better than a bowl of Lucky Charms, any day! Make your favorite recipe for chocolate cake..
Pour the batter into the greased pan/pans you are using...I use a spring form if I am making it into a cake rather than little cakes. .for the whole cake you need the whole recipe..
For the cake..350 55 min or so.. This is based on a recipe I got from a friend I worked with, Pat Biscardi...I changed it a bit..
Top of the evening to you! So good to see the green, Kathleen! This is YOUR month! Gosh, that cake looks delicious to me. I could use some chocolate. When I think of March, I think of you! What a beautiful dessert Kathleen! What a great kick off to March, Kathleen. 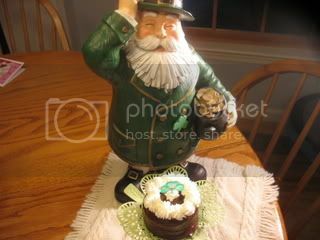 I love your leprechaun and wee cakes. I can't wait for that recipe - it sounds wonderful with the ricotta cheese in it. It's your month, Kathleen, you pretty Irish lassie. I've always like your stained glass shamrock wreath. The cake sounds very tasty and is pretty to look at. I love cream cheese in baked goods. And ricotta, mmmmm. Great start to March even if snow is on the way. Kathleen, nice to meet you! I see you are on Eastern L.I. Seems we have that in common, too. For many years my family had a beach house in Southold, and then 17 years ago my parents turned it into their retirement home. They are now both in assisted living in New Jersey, near me, but we still have the Southold house. Your cake recipe looks scrumptious! I think I'm going to have to copy that one down for when my girls are home from school. How did I miss this yestarday? Great post to usher in March. I like your little shamrocks in the title! The cake looks delicious. I will have to give that recipe a try one day. 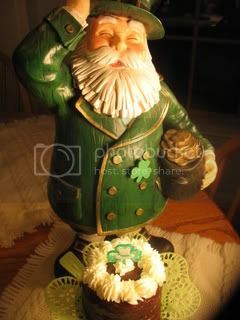 Love the leprechaun! Looks like St. Patrick's Day is a bit early this year! 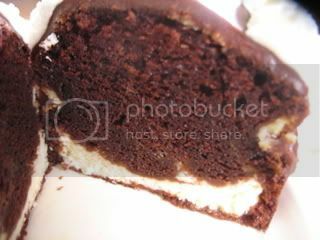 I wish I had a piece of that yummy cake right now, to enjoy while I'm snowed in (yet again). I was looking forward to this! Nobody does St. Pat's like you do, Kathleen! Great post! Cake looks so good! Love your Shamrock wreath !! 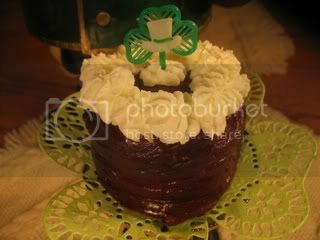 The cakes look great and your artistic decoration! Are you going to make 50 loaves??? ?